I know we’ve had a lot of these Q&A articles up lately, but as long as people keep writing them we pretty much have to keep linking to them. This one is from the hometown Pittsburgh Tribune Review, done with San Francisco 49er Shawntae Spencer. The article showed up in today’s Trib, but I assume it was done while Spencer was in town playing the Steelers over the weekend. Q: What were the emotions like to return to play at Heinz Field? Q: What are some of your fondest recollections of playing at Woodland Hills? Q: Were you a Steelers fan growing up in Western Pennsylvania? Andy Lee is having a very busy season. He’s also having the best season of any punter in the NFL. I know we’re only reaching the quarter mark of the season this weekend, but for a guy with the most punts in the NFL some of these stats (the ones that are averages) are even more impressive. And here is probably the most amazing stat. Andy has punted 19 times this year, including the 71 yarder. His punts have been returned for a total of 5 yards. FIVE YARDS. He does have 6 inside the 20, 5 touchbacks and 2 fair catches, but he basically has been killing the ball and doing it in a way that his coverage team has an excellent chance of giving up no return yards at all. Teams are currently averaging 9.5 INCHES of return per punt from Lee. The Steelers or All Sports As We Know It? This is totally off-topic, which might become slightly more the norm around here (hey we’ve had over 125 posts on this blog and I don’t think we’ve ever been more than slightly off topic, so we need to loosen up a bit). Doubt About it has a pretty interesting poll going on, with the expected results so far from yinzers. The premise of the poll is you have to choose: For one year you would have to banish, exile, not mention, destroy, forget, etc… either the Steelers or basically ALL OTHER SPORTS. Of course as I write this the Steelers are winning by 20%. I don’t understand this, as the Steelers play 16 games per year. The Pens alone play at least 82 games a year, 41 at home. And then you add in Pitt basketball and Pitt and Penn State football (WVU was pardoned somehow) and even the Pirates and you’re looking at around 15 times as many games as the Steelers give you. I just don’t see how you can choose the Steelers, but this is Pittsburgh I guess. HB Blades was forced into his first significant action on Sunday against the Giants when starting weakside linebacker Rocky McIntosh left the game with a shoulder injury. The game was tied in teh 4th quarter when HB was called upon. It seems from the initial reactions that HB played well in his short time in the game, although Washington did give up the winning touchdown while he was in the game. McIntosh went to the sideline late in the game after experiencing pain in both shoulders. 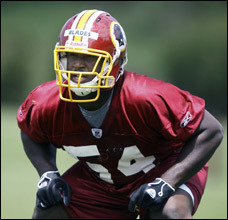 Rookie linebacker H.B. Blades replaced him in crucial situations, which wasn’t good news for Washington. A hard-working rookie, Blades is supposed to be relegated to special teams. The fact that Blades was in the game with the outcome undecided — well, that’s not what the Redskins expected. This interview from Pro Football Weekly actually took place before the rumor mills started about Larry wanting out of Arizona at the end of the season. So while that isn’t directly addressed, Larry doesn’t give the impression he is extremely unhappy…but he doesn’t seem extremely happy either. He’s basically just saying the right things the whole time, so you can take that as truth or as just athlete interview speak. Go ahead to the link above to read the interview, but it doesn’t offer a lot of insight on whether or not Larry is really happy. It does give a look at how his relationship with Leinart and Boldin has grown though, and that may be a factor in him staying in Arizona. Pro Football Talk in its Rumor Mill post from yesterday speculates on Fitz leaving Arizona after his contract expires. Apparently he isn’t happy with Coach Whisenhunt’s run-first approach, and it’s impact has showed in his stats through the first two games. Those number probably won’t get too much better against the Ravens this week. It’s basically stated that the rumor is pretty strong that Fitzgerald wants out after his contract, and with Anquan Boldin also needing paid, the Cards just can’t afford Larry. So instead of losing him for nothing a trade may be in the works. I’ve heard possible teams that would be interested as Seattle (would they really trade him to a division rival? I think not), Philadelphia and Minnesota. PFT mentions only Minnesota, being Larry’s hometown, as making the most sense. Minnesota could be an exciting offense for Fitzgerald with Adrian Peterson and a young QB. He’d definitely be the #1 receiver there, but I’d really like to see him go to an AFC team on the East Coast so that we could see him more often. In another Cardinals-related note, after some statistic corrections following Sunday’s win over Seattle Gerald Hayes was credited with his first forced fumble of the season. After watching the game on NFL Replay yesterday I was pretty amazed he didn’t get a forced fumble, and it’s good to see this correction was made. John Crist: There was a lot of talk about the Cowboys signing Tank Johnson this week and possibly trying to get some information on the Bears from him. Did the Chicago coaching staff approach you at all about what to expect from Dallas? Lousaka Polite: Me being there the last three years, there’s things that I do know about the offense. Basically, what I know, I gave them a few pointers of how things can go. But I don’t know in detail. I know what I do know from when I was there. Things changed the last couple weeks. We watched the film, and hopefully we’re prepared for them. So if that doesn’t make you want to sign up for a Bears Report subscription I don’t know what will. If anyone has one of these subscriptions and can fill in any more details (don’t give us the full audio or text, that’s stealing) in the comments, we’d be much appreciative. Scout.com has a nice feature on rookie Darrelle Revis and his early success as the new starting corner for the Jets. It’s a well known fact that a young cornerback is usually viewed as easy prey for an offensive coordinator. Quarterbacks have been known to salivate at the opportunity to take advantage of an inexperienced DB. For some inexplicable reason, this has not been the case. It’s Revis’s counterpart, David Barrett, that seems to be the marked man. Teams are still throwing at him, as seen when he covered TO in week 1, but not as much as they usually do with rookie corners. I think that shows what a special player Revis really is, other teams don’t need to test him to find out that he’s the real deal; it’s obvious from watching film that he is. So far this season Revis has 13 tackles (10 solo) and 2 passes defensed. He also dropped what could have been a very nice interception on Sunday. That theoretically (it’s very early, we know) puts him on pace for around 104 tackles (80 solo), 16 passes defensed and probably 2 picks. That would be a pretty awesome rookie year and although it’s unlikely, as bad as the Jets’ offense is and as much time as he’ll be spending on the field thanks to the rest of the Jets’ defense sucking…it is possible.